As Mae West said, “It is better to look marvelous than to feel marvelous.” In that spirit, create assignments that “look” good. In the top right corner of your assignment post your name, class, section, assignment name and date. K.I.S.S. : “Keep It Simple, Stupid!” For our purposes a literary analysis paragraph is about how one theme is used in in one part of the piece of literature. 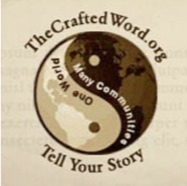 Your one word theme is the specific aspect of the human condition as captured by a central theme in the writing piece. It should be centered below your quote and above your opening paragraph in size 14, bold font. Your theme should be one word (ideally) or a short phrase—not a full sentence. This quote is by no means “necessary” for a good paragraph, but it is good practice, and it keeps you focused on the theme of your paragraph. Choose a quote from the writing piece that fully captures the theme you wish to explore in your paragraph. Well, I warn't long making him understand I warn't dead. I was ever so glad to see Jim. I warn't lonesome now. I told him I warn't afraid of HIM telling the people where I was. I talked along, but he only set there and looked at me; never said nothing. This is your first sentence of a body paragraph. In a way, it is almost like the “title” of your paragraph. It is meant to indicate the direction of the paragraph in a compelling and interesting way by creating a clear, concise, and memorable statement of a universal theme. Do not mention the writing piece in this sentence because this sentence is supposed to introduce the theme of your paragraph in a general way that is interesting to a potential reader. Highlight the one-word theme in red. Nothing beats spending time with a good friend. This is the topic sentence of your paragraph—and as such, it is the most important sentence in your paragraph! The Narrow Theme narrows down your theme in a specific way by writing one sentence that captures how your one-word theme is used in the literature you are analyzing. Be sure to include a specific reference to the writing piece AND a specific reference to your one word theme in this sentence. Book titles are in italics. Short stories and poetry are within quotation marks. In the book, The Adventures of Huckleberry Finn, by Mark Twain, Huck and Jim become two inseparable friends that set out on a great journey together. Follow your Narrow Theme with one or two more sentences that add detail or explanation to your topic sentence and narrows down the topic even further. Be sure to include your one-word theme—or a very close variation of your one word theme—somewhere in this part of your paragraph. Highlight your theme in red. DANGER!!! 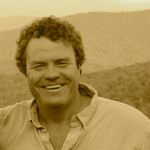 : Beware of creating a series of new topic sentences in your one/two punch. At the end of your one/two punch your readers should have a clear and extremely focused idea of the direction of your paragraph. The two friends go through a lot over their time together, and they never give up on each other. They are as different as people can be, physically; however, it is their similar minds that bring them together as friends. The setup is the text “reference” that describes in detail (and explicates) the “scene” leading in to your quote from the literary piece. The setup and the smoking gun work together to add the “proof” that you have read and studied the piece of literature you are analyzing. Without introducing support from the actual text of the writing piece, you are just rambling around and going nowhere—unless your readers are already fully aware of everything that happens in your piece of literature. This setup to your smoking gun [text support] should include the details that will help your reader visualize the scene leading into the quote. To help a reader visualize, be sure to include as much of the who, what, when, where, why of the scene or moment you are describing. Include each of these in brackets in red. See my example. The smoking gun is the actual quote (text support) you use from the writing piece you are analyzing. Text reference (setup) and text support (smoking gun) work together to prove you've read and analyzed the text and prepares your reader for your head and heart section of the paragraph. If the quote is three lines or more, put the quote in italics without quotation marks; put your quote reference under the quote; create a new paragraph for the quote, and finally, indent the whole quote. Write at least four sentences that, explicate, illustrate, and elaborate upon your topic sentence and the “Theme” as it used in literary piece. This is the “brains & brilliance” part of your paragraph. It shows your reader your how much you know and how insightful you are about your theme and how it used in the literary work you are discussing. This is where your passion and knowledge come into play. If you don't have much head and heart, then I (and I am sure, other teachers) immediately sense a lazy or ill-prepared student—or even worse…. Notice that Ryan includes several references to friendship (his theme) in his head and heart--which is especially important in the final sentence leading into his conclusion. You do not need to always use the exact theme word as long the word conveys the same theme. Many writers, in their quest to sound smart and informed, fall into the trap of introducing new and/or irrelevant topics into a paragraph--usually at this point--or they add in more text support. Don't!!! It distracts and ticks off good readers, and it confuses and frustrates weak readers. Either way, you lose your audience, which is not a good way to earn a living as a writer. If you have a new topic that you feel is awesome, then have the decency to give that topic its own paragraph. Huck declares a friend as someone who he can trust; by saying that he was not scared of Jim telling on him, he is showing that he trusts Jim as a good friend. He knows that Jim is the kind of person that would comfort him and give him good company - that is exactly what a good friend does. Huck is white kid who hasn't quite yet developed feeling for others. Jim, on the other hand, is a slave; however, their similar taste for adventure is what ultimately makes them friends. Throughout the rest of the novel, Jim and Huck remain close friends. They realize that neither of them could have evaded capture for so long if it weren't for their friendship. This is the concluding sentence or sentences that wants to close out your thoughts (get out) or "transition" to a potential new paragraph (get on). Try to make this as clear, concise and memorable as your opening sentence. If it is "transitioning" to a new paragraph, (as is usually the case in an essay) craft your words in a way that sets up the next paragraph. This creates what is called "logical flow." If the paragraph is simply ending, (as in a brief literature response) try and find a way of tying back into your opening theme in a new and refreshing way. This gives your readers a concise and confident visual and mental cue that you have said all you need to say. Be sure to--one more time—include a reference to your theme in the conclusion—and highlight it in red! For Huck and Jim, their friendship has allowed them to succeed and thrive together. Huck declares a friend as someone who he can trust; by saying that he was not scared of Jim telling on him, he is showing that he trusts Jim as a good friend. He knows that Jim is the kind of person that would comfort him and give him good company - that is exactly what a good friend does. Huck is white kid who hasn't quite yet developed feeling for others. Jim, on the other hand, is a slave; however, their similar taste for adventure is what ultimately makes them friends. Throughout the rest of the novel, Jim and Huck remain close friends. They realize that neither of them could have evaded capture for so long if it weren't for their friendship. For Huck and Jim, their friendship has allowed them to succeed and thrive together. Literary analysis is a type of writing where a writer literally breaks a story down to its most basic elements and then analyzes how and why those elements work in that particular story. These elements include identifying important themes, comparing and contrasting stories and authors, defining writing techniques and devices—and anything else that relates to the way in which a story is structured and told. Literary analysis deals only in what can be proved objectively via the text, and not because how and why a certain story makes you—as an individual—think and feel subjectively about that story. The Literary Analysis Paragraph #1 is designed to help any writer find and explicate the major themes in a story and to define the importance of these themes in the story. Writing an analysis paragraph is a bit like going to the doctor: you really hope that whatever your doctor finds, another doctor would find the same thing. In short: a literary analysis is simply a search for and an explaination of the "truth" of a piece of literacture. Report: This is where you use your Evernote notebook or Google docs folder--any way that helps you effectively collate and store information—and collects your reports. This is a place for an essay outline, notes and findings saved, a list of outside sources you may have used to help further your understanding of the texts, snippets of text, etc. All of the "stuff" you have collected is in your report. Analyze: When you analyze, you attempt to "figure out" the importance or what you have discovered and observed in your reading and annotating and reporting. You look for and note the who what when where why that "proves" a point. It is here where you decide on the "one" theme that you are going to write about in your paragraph. Present: This is your finished product that presents your finding to the world at large in an interesting, compelling, thorough way. The little kid in Belgium, the Fiji islander, the professor in Germany, and the teenager in Singapore should all relate to and agree with what you have presented—simply because what you have analyzed is universally true for every breathing, thinking, sentient being. The fact that you, as the analyst, are dealing with objective and provable facts is the main reason why most teachers forbid the use of the “I” voice in this type of writing. It is here where I make the distinction between literary analysis and literary reflection: a literary reflection “reflects” your unique emotional and intellectual response to the story; whereas, a literary analysis “analyzes” the form, devices, style, and content of a story. In an analysis, the “I” is not needed and does not help you prove your point because the point is proved using verifiable facts. Throwing yourself into the mix just muddies the water and burdens your writing with unnecessary words and distractions. 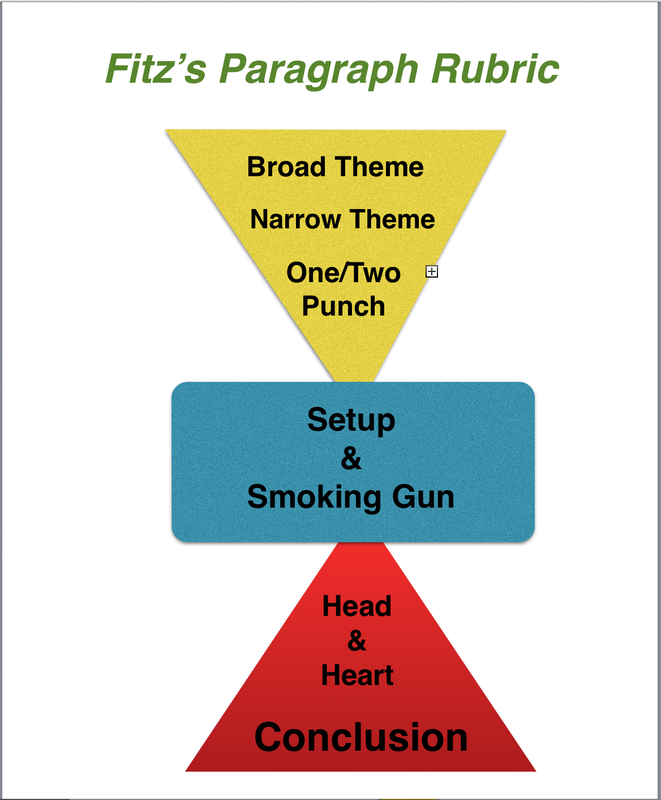 The basic structure of the literary analysis paragraph rubric is, however, essentially the same as the narrative paragraph rubric: you open with a clear and concise guiding theme or topic [broad theme, narrow theme, one/two punch]; you offer supporting facts and proof [smoking gun]; and in your third section of the paragraph, you explain and explicate how your guiding theme relates to the story [head and heart]. Finally, you “get on or get out.” If you are writing a single paragraph, you get out with a sense of finality; if you are writing a multi-paragraph essay, you may need to find a way to transition in a logical and unforced way to the next paragraph in your essay. It is important as a reader, and even more so as a writer, to be able to understand the importance of themes in a piece of literature, for exploring the themes of being human—and being connected (or disconnected) to the rest of humanity is the essential role of any writer! We don’t read because we care about a writer; and if you are a writer, you need to understand that nobody cares about “you” as a person any more than some guy living three towns over from you; however, we do care about ourselves, and if as a writer you put us in touch with a deeper side of our head and heart; if you pull on the strings of our imagination in such a way that we cry when you want us to cry, laugh when you want us to laugh, and think what you want us to think—then you have succeeded as a writer, and those people who do not care about you as a person will care about what you write, and they will beat a path to an door where they can find the pages that hold your words. The golden rule of writers is to always know what your readers want and expect—and give it to them in well-crafted writing, which almost always means well-constructed paragraphs! I love using the term “well-crafted” because it implies that writing well requires a deliberate and attentive focus. Good writing is never finished; it is abandoned. Honestly: give yourself ninety minutes to two hours to finish this. A writer’s first words are seldom his or her best words. Over the years I have read and graded thousands of these paragraphs. It is not hard to figure out who gave a damn and who didn’t. It is obvious who reads the left side of this rubric before writing in the right side. So give a damn. It works. Be sure to follow “all” of the details of the rubric explained in the rows below, and try your hand at a creating a well-crafted literary analysis paragraph. In the rubric , I use an example paragraph written by Ryan Ewing one of my 8th grade students in 2013. Replace his text with your own text and save this as Lastname Literary Analysis and upload to your dropbox on Schoology for this assignment.